In at least one application, I have the need to keep old versions of records in a relational database. When something should be updated, instead a new copy would be added and the old row would be marked as not current. When something should be deleted, it should instead be marked as not current or deleted. This is good if you only need to know what the most current version of a record is, and only enumerate previous versions of a single record separately. Point-in-time queries are even more painful than with the second variant. The second approach can basically represent the first as well, but it's harder to know what version is the most recent - because you can also add versions for the future. Also, the ValidFrom/ValidTo design is able to declare overlapping ranges, and by definition, the row with the highest ValidFrom shall apply in that case. Now I'm wondering how to implement an efficient solution to manage and query such data. Normally you can just write any SQL queries with any kind of WHERE, GROUP BY and JOIN to get the records you want. But with versioning applied, you need to consider the correct version of each record. So instead of joining every version of a record from another table, an appropriate condition must be added to only select the version that is valid at a given time. This still doesn't handle selecting the right version of overlapping time spans. I could add some clean-up method that flattens out overlapping version time ranges, but I don't know how efficient that would be. I'm seeking to create a class (in C# in my case) that provides methods to read and write such versioned records. The writing is relatively easy because the queries are simple and easy to control with transactions. but querying would require building an API that accepts every fragment of an SQL SELECT query and intelligently builds the SQL query to execute from that. Thie query method should only accept one additional parameter that specifies the time to fetch the data from. Depending on each entity's validity range, different versions would be selected of each. These are basically my incomplete thoughts about versioning data and providing an API to manage it. Have you already done such a thing and would like to tell me what you think of it? Do you have another idea that worked well? Could you offer me any advice on how to implement this API? While I theoretically know how to do it, I think it's a lot of work and I can't estimate how well it will work. Take snapshot when an update happens in detail table(before any update an snapshot will be created). Another alternative will be Event Sourcing pattern. An Entity–attribute–value approach may come in handy. An implementation sample can be found here. I am working with SQL within Oracle products (Database 11g). We have huge project and versioning is an essential part of its. Both approach you mentioned are useful. Assumption: All tables you want to versioning must have primary key. If you want all historical data about one primary key, you can select data from "production" table and historical table select only key you want and sort by timestamp (for active record will be timestamp SYSTIMESTAMP). And if you want to see in which state is which record, you can select first row for which your date is higher than date in history (or production table). For before update trigger look here. And you can use the same select as above again. Please, look on this answer also: Versioning in SQL Tables - how to handle it? I do not know whether you see the difference between valid record and valid "object" inside. In our work project we don't have any valid overlapping ranges .. for example, said table with documents, primary key composite from document name and version number ... We have document A (and this document is valid for years 2010 - 2050) it has 2 versions. In version 1 is document valid from 2010 to 2020 (object version, not record version) The document in some state P. This record is valid from 2014-9999. In version 2 document is valid from 2021 to 2050 (object version, not record version) This record is valid again between 2014-9999. And document is in state Q. All this operations for us in our work project do PL/SQL code. In year 2018 if you select document for valid records you get 3 rows: A1 A2 A3. If you select versions valid in year 2015 you get only A1(INVALID) A2(INVALID). So, you have full history, even if the document has 3 valid version, valid in the same point (record validity). And object validity is separated. This is a really good approach and must cover all your requirements. I Know that this is an old post, But I wanted to reply not only to provide solution but also to exchange my ideas with you and also to discuss the most efficient solution for this important issue of versioning. Insert a new record by increment the (Serial) Field and keeping the very same Field (ID) of the updated record, (ValidFrom) will be NOW and (ValidTo) will be null and IsCurrent will have false. 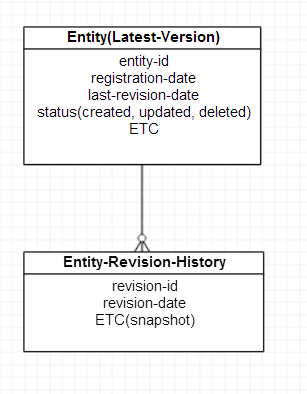 by this way you will not have problems with joins as joining tables with field ID will show you all record history. IF you have FKs to a parent table , You probably want to remove the value of the FK field. I have worked with tracking versions of records but never with overlapping ranges. However, I have experience selecting records under similar criteria. Here's a query that should do what you want. This assumes that ValidTo can also be null to indicate no end date. If ValidTo can't be null then you can remove the or condition. This also assumes a record is valid through the end of the day of the ValidTo date. If the record becomes old at the beginning of the day of the ValidTo date change >= to just >. This worked for the handful and test data I tried it on but I'm fairly certain it'll work for all cases. As for as efficiency, I'm not a SQL expert so I really don't know if this is the most efficient solution. Not the answer you're looking for? Browse other questions tagged c# sql database database-design version or ask your own question.